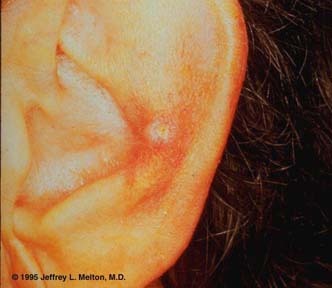 These lesions occur on a part of the ear that receives frequent, prolonged pressure, such as during sleep. They usually present as tender, irritated, skin-colored papules or erosions. They are often difficult to differentiate from basal or squamous cell carcinoma and therefore may need to undergo biopsy to rule these out. Location and tenderness are clues to diagnosis. Treatment centers around relieving the pressure.